Now that my twins are four, I feel nostalgia for the baby part, but even moreso, excitement for today. As I write this list, I see that it has gotten easier in a thousand ways, large and small. If you are reading this from the stormy beginning days, hang in there. As a mother of twins, my double-baby radar is finely honed. Almost every weekend, I easily spot new twin parents out on the main shopping drag near my house. It's generally like this: the dad pushes a double stroller, shuffling and dazed, while the mom trails off to the side, coffee cup in hand. Their tiredness is palpable--or maybe it's my own trace memory of those early months with multiples. Back then, the simple act of leaving the house with two infants in tow felt like a Seal Team Six mission--specialized gear, superhuman exertion, and elaborate planning--all with a keen awareness that unforeseen hell could break loose in unfriendly terrain. Now, my fraternal twin sons are four, and the details of the early days of motherhood have blurred into a fog-enshrouded montage of sleepless marches, dribbling bottles, and panicked episodes of googling symptoms both real and hypothetical. I also googled that all-important question: "When do twins get easier?" I did this especially during rough patches with the babies--where "rough" was defined as symphonic wailing, obstreperous non-eating, and/or virus-induced non-sleeping. In hindsight, these intense periods might also be labeled "normal." Twins provide a built-in laboratory for comparison and worry, and despite my love for my boys, it sometimes left me downtrodden and desperate. I hoped to find a precise age when things would get easier, preferably stated in months, so I could mark my calendar. From there I could count down. It was like wanting to hear from an airplane captain the predicted end of turbulence. The Internet, it turned out, is more like the flight pilot frantically telling attendants to buckle up indefinitely. If you poke around online to answer, "When do twins get easier?" many people online say, "Never." Allow me to digress. The other day my beloved dog loped to his special barf spot--which happens to be on the sofa--and I sprang into action. In what felt like slo-mo, I reached him right at the first retch, ripping the black tank top off my back, then stashing it beneath his mouth, thereby catching the vomit in the air. "Wow," my husband said, as I knelt to comfort the dog. Meanwhile, my sons were unimpressed. They were like, Of course Mommy catches throw up in her shirt! I had a flash of Mom Power. I felt like I'd gloved an impossible fly ball, saving the game. If I pause to reflect, I feel the same way with my twins--things have gotten easier, but also, I've gotten tougher. Stronger. Better. Kinder. Every six months, twins get easier--or at least mine have, and/or I've gotten less stressed. 1. The day they were born. The pregnancy was so uncomfortable and scary I started feeling relief halfway through my C-section. 2. That time a random mom from my twins club suggested we meet in a park, since we shared a zip code. She turned into one of my most adored friends, along with two other moms I met through her. 3. When I saw one of my twin boys sucking the other's thumb, the two of them nestled together. 4. The evening I read something written by a triplet mom, about how every night she congratulated herself on keeping all her children alive. I realized I too could shift my definitions and increase my happiness. 5. When a woman on the street said to me as I pushed my two happy boys in a double stroller, "I'm glad I'm not you," and I said back, "I'm glad too." 6. That month sleep training worked. Our boys achieved the mythical twelve hours of sleep mark. My husband and I not only had a conversation, but hunkered down for some delicious couch lounging and TV watching. 7. Every time a friend said, "Do you want me to bring dinner over?" 8. That winter when the four-way cold finally started to pass. I realized that I wasn't living in hell, it was just a virus. 9. That day I got my period and realized my feelings of doom were largely hormonal. Everything is a cycle. 10. When my sons first put on their own pants and shoes. 11. When I realized I'd found a pair of pants I liked, made of poo-resistant fabric, and wore them all the time. 12. When I revised my definition of "clean house" to accommodate reality. 13. When they started chatting with each other at bedtime, more interested in each other than calling us back to their bedroom. 14. The day my late-to-walk son stood up, let go, and toddled across the deck, after a harrowing appointment at a local hospital. 15. That night one of my sons said at dinner, "I'd like to invite a volunteer to join me in the bathroom," and I realized we had potty trained our children and that the era of 10,000 diapers had ended and we could flush. 16. When the boys started saying, "Don't mess with my brudder." 17. 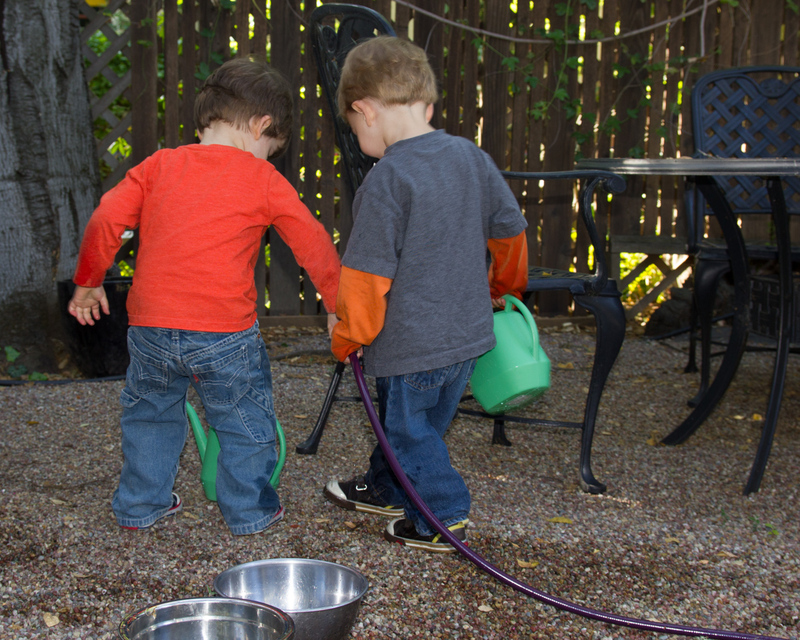 The week I watched them, from a comfortable distance, entertain each other for hours with rocks, sticks, roly-poly bugs, pillows and plastic clothes hangers in the back yard. 18. That day one weekend when my twins pushed their own strollers for more than two miles and enjoyed it. 19. The first time we went to the beach and they said, "This is a HUGE sandbox." 20. When I realized I no longer had to wear poo-resistant pants--a symbolic shift. K.K. Goldberg is author of The Doctor and the Stork: A Memoir of Modern Medical Babymaking, a book about twins, twin pregnancy, and pregnancy after IVF, meant to amuse, comfort, commiserate and distract.